Not only does Communion enlighten our mind by a special grace, revealing to us, by impression rather than by reason, all that our Lord is, but it is also, and above all, the revelation to our heart of the law of love. The Eucharist is the sacrament of love par excellence. Certainly the other sacraments are proofs of God’s love for us; they are gifts of God. But in the Eucharist, we receive the Author of every gift, God Himself. So it is in Communion especially that we learn to know the law of love that our Lord came to reveal. There we receive the special grace of love. There, finally, more than anywhere else, we acquire the practice, the virtue, of love. First of all, what is love? It is a gift. That is why the Holy Spirit, who, as love, proceeds from the First and Second Per­sons of the Most Holy Trinity, is truly the Gift. How do we recognize love? By what it gives. See what our Lord gives us in the Eucharist: all His graces and all His possessions are for us; His gift is Himself, the source of every gift. Communion gives us participation in the merits of all His life and obliges us to recognize the love that God has for us, because, in Communion, we receive the whole and perfect gift. How did you begin to love your mother? Sleeping within you, without sign of life, was a seed, an instinct, of love. Your mother’s love awakened it; she cared for you, suffered for you, fed you with her body. By this generous gift you recognized her love. Well then! Our Lord, by giving Himself entirely to you, and to you in particular, proves to you invincibly that He loves you personally with an infinite love. He is in the Eucharist for you and entirely for you. Others enjoy Him also, to be sure, but in the same way that they benefit from the sun without preventing you from enjoying its rays as much as you wish. 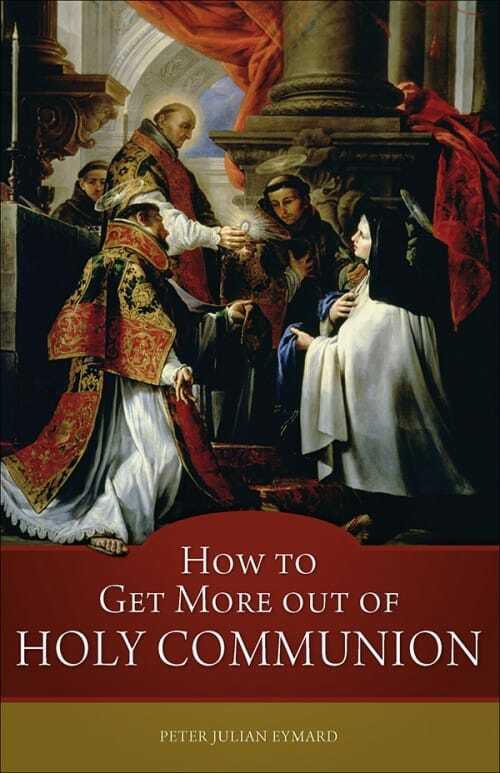 This article is from “How to Get More out of Holy Communion.” Click image to preview/order. Ah, such is this law of love engraved in our hearts by God Himself in Communion! In olden times, God wrote His law on tables of stone, but the New Law He has written in our hearts, with letters of fire. Oh, whoever does not know the Eucharist does not know the love of God! At most, he knows certain effects of it, as the beggar recognizes the generosity of the rich man from the few coins he receives from him. But in Communion, the Christian sees himself loved with all of God’s power to love, with all of Himself. Therefore, if you would really know God’s love for you, receive the Eucharist, and then look within you. You have no need to seek elsewhere for further proofs. If you do not receive Communion, you can love our Lord as your Creator, your Redeemer, and your Rewarder, but you will never see in Him your Friend. Friendship is based on union, on a certain equality, two things that are found with God only in the Eucharist. Who, I ask you, would dare call himself the friend of God and believe himself worthy of His particular affection? A servant would insult his master in presuming to treat him as a friend; he must wait until his master grants him the right by first calling him by that name. He will do even more; He will appear to Mary Magdalene and say to her, “Go to my brethren.” What? His brethren? Can there be a higher title? Yet the Apostles had received Communion only once! What will it be for those who, like us, have received Him so often? Will anyone be afraid now to love our Lord with the tenderest affection? It is well to tremble before Communion, thinking of what you are and of Him you are about to receive; you need His mercy then. But afterward, rejoice! There is no longer room for fear; even humility must make way for gladness. See how joyous Zacchaeus is when our Lord accepts his hospitality! But see, too, how his devotion is fired by this kind reception; he is ready to make every sacrifice and to atone over and over for all his sins. The more you receive Communion, the more will your love be enkindled, your heart enlarged; your affection will become more ardent and tender as the intensity of this divine fire increases. Jesus bestows upon us the grace of His love. He comes Himself to kindle this flame of love in our hearts. He feeds it by His frequent visits until it becomes a consuming fire. This is in truth the “live coal which sets us on fire.” And if we so will, this fire will never go out, for it is fed not by us but by Jesus Christ Himself, who gives to it His force and action. Do not extinguish it by willful sin, and it will burn on forever. Come often, every day if necessary, to this divine Furnace to increase the tiny flame in your hearts! Do you think your fire will continue to burn if you do not feed it? Communion makes us practice the virtue of love. True and perfect love finds its full expression only in Communion. If a fire cannot spread, it goes out. So our Lord, wishing us to love Him and knowing how incapable of it we are of ourselves, fills us with His own love; He Himself comes and loves in us. We, then, work on a divine object. There is no gradual passage or transition; we are simultaneously in the grace and in the object of love. That is why our best and most fervent acts of love are made during our thanksgiving; we are nearer then to Him who forms them. Pour out your heart to our Lord at this time. Love Him tenderly. Do not try so hard to make this or that act of virtue. Let our Lord grow within you. Enter into partnership with Him; let Him be the capital in your soul’s traffic, and your gains will be doubled with the doubling of your spiritual funds. Working with and by our Lord, you will gain a greater benefit than if you tried to increase your virtues simply by multiplied acts. Receive our Lord, and keep Him as long as you can. Make plenty of room for Him within you. To let Jesus Christ increase in one’s soul is the most perfect act of love. Certainly, penitent and suffering love is good and meritorious; but the heart is re­pressed by it, weighed down beneath the thought of the con­tinual sacrifices it must bear. This way, on the contrary, the heart expands, opens fully and freely; it shows its happiness. For one who does not receive Communion, these words have no meaning; but let him plunge into this divine fire, and he will understand. No, it is not enough simply to believe in the Holy Eucharist; we must also obey the laws it prescribes. Since the Eucharist is above all the Sacrament of love, our Lord desires us to share in that love and draw inspiration therefrom. So come to Jesus out of love for Him! We must come humbly, to be sure; but let love, or at least the longing to love, be our ruling motive. Let us desire to pour out our heart in His Heart; let us give evidence to Him of our tenderness and affection. Then we shall know what depths of love are in the adorable Eucharist. Editor’s note: This article is adapted from a chapter in St. Peter Julian Eymard’s How to Get More out of Holy Communion, which is available from Sophia Institute Press. St. Peter Julian Eymard (1811–1868) was ordained a priest for the Diocese of Grenoble in 1834. Five years later, he joined the Marian Congragation, for which he taught and preached. He was appointed Provincial of the Oblates of Mary in 1845. He founded two religious orders to promote devotion to the Eucharist. He died in 1858.